Bringing together world-renowned researchers to explore natural nonliving organic matter (NOM) and its chemical, biological, and ecological importance, Biophysico-Chemical Processes Involving Natural Nonliving Organic Matter in Environmental Systems offers an integrated view of the dynamics and processes of NOM. This multidisciplinary approach allows for a comprehensive treatment encompassing all the formation processes, properties, reactions, environments, and analytical techniques associated with the latest research on NOM. In addition to the above topics, the coverage includes such relevant analytical techniques as separation technology; analytical pyrolysis and soft-ionization mass spectrometry; nuclear magnetic resonance; EPR, FTIR, Raman, UV-visible adsorption, fluorescence, and X-ray spectroscopies; and thermal analysis. Hundreds of illustrations and photographs further illuminate the various chapters. 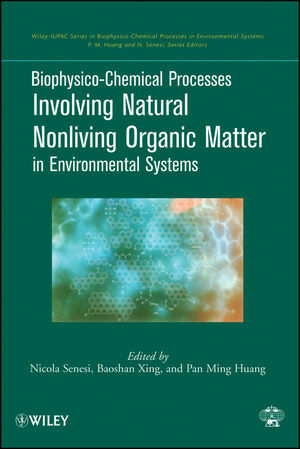 An essential resource for both students and professionals in environmental science, environmental engineering, water science, soil science, geology, and environmental chemistry, Biophysico-Chemical Processes Involving Natural Nonliving Organic Matter in Environmental Systems provides a unique combination of the latest discoveries, developments, and future prospects in this field. Nicola Senesi, PhD, FSSSA, FASA, FPSSS, is Professor of Soil Chemistry and Head of the Department of Agroforestal and Environmental Biology and Chemistry of the University of Bari, Bari, Italy, where he has been actively involved in research and teaching since 1969. He was conferred a doctorate honoris causa by the Institut National Polytechnique de Toulouse, France, in 2000. He has edited ten books and published over 250 scientific refeered articles and book chapters. Baoshan Xing, PhD, is Professor of Environmental and Soil Chemistry at the Department of Plant, Soil, and Insect Sciences, University of Massachusetts Amherst, where he has been actively involved in teaching and research since 1996. Dr. Xing is a Cheung Kong Scholar and has published over 150 scientific refereed articles. His research work is ranked in the top 1% of cited authors for journals in environment and ecology. Dr. Xing received his PhD degree from the University of Alberta, Canada, in 1994. Pan Ming Huang, PhD, FAAAS, FASA, FCSSS, FSSSA, FWIF, is Professor Emeritus of Soil Science at the University of Saskatchewan in Saskatoon, Canada. Dr. Huang has published over 300 refereed articles and book chapters, written two books, edited eighteen others, and served on many editorial boards. He received the Distinguished Researcher Award from the University of Saskatchewan and the Soil Science Research Award from the Soil Science Society of America. 1 Evolution of Concepts of Environmental Natural Nonliving Organic Matter (M. H. B. Hayes). 2 Formation Mechanisms of Humic Substances in the Environment (P. M. Huang and A. G. Hardie). 3 Organo-Clay Complexes in Soils and Sediments (G. Chilom and J. A. Rice). 4 The Effect of Organic Matter Amendment on Native Soil Humic Substances (C. Plaza and N. Senesi). 5 Carbon Sequestration in Soil (M. De Nobili, M. Contin, and Y. Chen). 6 Storage and Turnover of Organic Matter in Soil (M. S. Torn, C. W. Swanston, C. Castanha, and S. E. Trumbore). 7 Black Carbon and Thermally Altered (Pyrogenic) Organic Matter: Chemical Characteristics and the Role in the Environment (H. Knicker). 8 Biological Activities of Humic Substances (S. Nardi, P. Carletti, D. Pizzeghello, and A.Muscolo). 9 Role of Humic Substances in the Rhizosphere (R. Pinton., S. Cesco, and Z. Varanini). 10 Dissolved Organic Matter (DOM) in Natural Environments (F. H. Frimmel, and G. Abbt-Braun). 12 Natural Organic Matter in Atmospheric Particles (A. da Costa Duarte and R. M. B. Oliveira Duarte). 14 Analytical Pyrolysis and Soft-Ionization Mass Spectrometry (P. Leinweber, G. Jandl, K-U Eckhardt, H-Rolf Schulten, A. Schlichting, and D. Hofmann). 15 Nuclear Magnetic Resonance Analysis of Natural Organic Matter (A. J. Simpson and M. J. Simpson). 16 EPR, FTIR, Raman, UV-visible Absorption and Fluorescence Spectroscopies in Studies of NOM (L. Martin-Neto, D. M. B. P. Milori, W. T. L. Da Silva and M.L. Simões). 17 Synchrotron-Based Near-Edge X-Ray Spectroscopy of NOM in Soils and Sediments (J. Lehmann, D. Solomon, J. Brandes, H. Fleckenstein, C. Jacobson, and J. Thieme). 18 Thermal Analysis for Advanced Characterization of Natural Nonliving Organic Materials (E. J. Leboeuf and L. Zhang).